Noteworthy, in November 2014 Degtyareva was ranked 947 in the individual ranking WTA – it was her best achievement in the short-lived career. And in 2014 she completed 1012-th (now 1084-I) and 952 th in pairs (now I-904), where in October she moved to the highest 858-th line. She spent 52 match, which scored 22 victories. In doubles she has participated in 46 games, winning 20 of them. The last one for the girls was the tournament in Antalya, Turkey, where she in 1/16 qualifying competitions in two sets easily beat Fanny Bengtsson from Sweden – 6: 0, 6: 0. 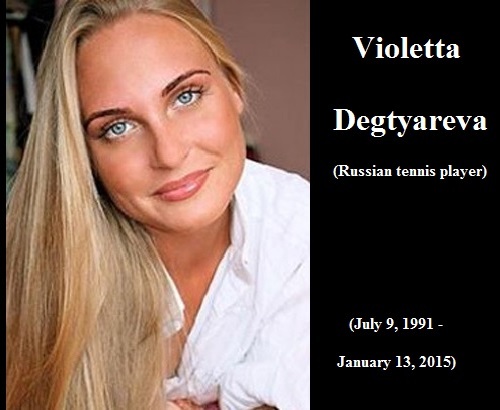 – The Internet is filled with messages that allegedly Violetta died during a training session. That’s not true! After the New Year she didn’t appear on the court. The person had a holiday, New Year holidays, as we all did. I, too, for example, just yesterday for the first time after the New Year went to court. Therefore, I want to repeat once again: it was not so. Because of this false information, we have a call from the prosecutor’s office, asked to give an explanation. Even the doctors have no answer to this question.